Have you ever seen paint like this before? 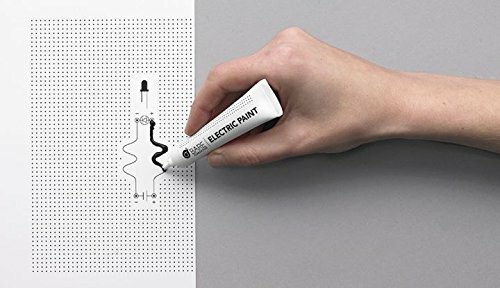 With this awesome electric paint you can design, discover, and create interesting electronic projects. With the Bare Conductive Electric Paint Pen you can paint circuits or sensors. You can also use Electric Paint as a conductive adhesive on nearly anything including paper, plastic, textiles, and conventional electronics. The non-toxic water-soluble paint provides a new way to engage in electronics like never before. The paint dries at room temperature and is suitable as a cold solder. With this amazing electric paint pen, you can be more creative and have more fun with electronics! With the electric paint pen, you’re able to teach resistance, circuitry, polarity, or voltage in a fun and unique way. The paint works with electrical components, prototyping materials, PCBs, microcontrollers, e-textiles, and conductive thread. The Electronic Paint Pen includes the application and storing instructions. The paint should be used within 6 months of opening and can be removed from most surfaces using soap and water. The thinner the layer of paint the faster it dries. Also, it’s important to note that conductivity increases as the paint dries so allow drying time before testing the projects. So are you ready to have more fun with electronics and create unique projects! Get the Bare Conductive Electronic Paint Pen today!